The event, part of a weeklong celebration of the inauguration of Stephanie Herseth Sandlin as Augustana's 24th president, was held in the Froiland Science Complex. 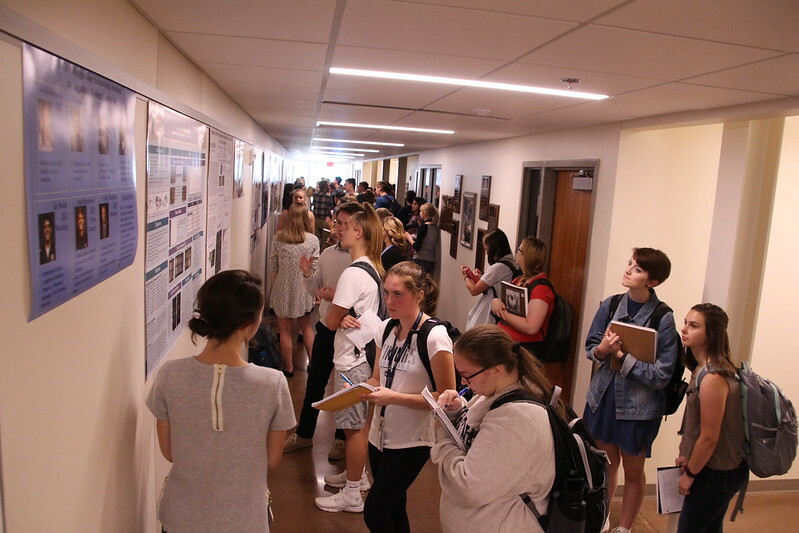 It featured poster presentations by students from the Natural Science division as well 10-minute discussions, followed by Q&As, by students from the Social Science and Humanities divisions. Student artwork was displayed for attendees to view as well. We caught up with sophomore Trey Waldrop as he displayed a poster on research he conducted with Augustana Associate Physics Professor Dr. Drew Alton on "Data Monitoring in the DarkSide 50 Dark Matter Experiment" — a study, he said, designed to help fill in the gaps of particle physics, as well as grow knowledge and understanding. In the Mikkelson Auditorium, senior Abbie Sell gave a formal presentation on "Prayer Experience Moderates Relationship Between Private Prayer and Rumination" in which she explored how prayer practices affect mental health. Inaugural events continue on Thursday with the dedication of the new Nelsen and Balcer Apartment buildings beginning at 10 a.m.